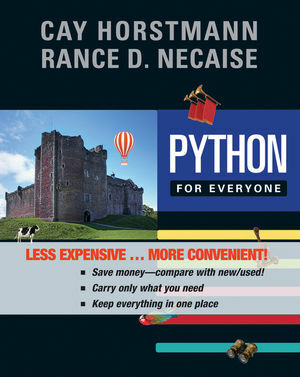 Python for Everyone, 1st Edition is a comprehensive introduction to Python and computer programming, which focuses on the principles of programming, software engineering, and effective learning. It is designed for a one-semester, mixed-major, first course in programming. Nobody supports your desire to teach students good programming skills like Cay Horstmann and Rance Necaise. Active in both the classroom and the software industry, Horstmann and Necaise know that meticulous coding--not shortcuts--is the base upon which great programmers are made. Using an innovative visual design that leads students step-by-step through intricacies of Python programming, Python For Everyone, 1st Edition instills confidence in beginning programmers and confidence leads to success. Cay Horstmann grew up in Northern Germany and attended the Christian-Albrechts-Universitat in Kiel, a harbor town at the Baltic sea. He received a M.S. in computer science from Syracuse University, and a Ph.D. in mathematics from the University of Michigan in Ann Arbor. For four years, he was VP and CTO of an Internet startup that went from 3 people in a tiny office to a public company. He now teaches computer science at San Jose State University. Cay also writes books and articles on programming languages and computer science education.